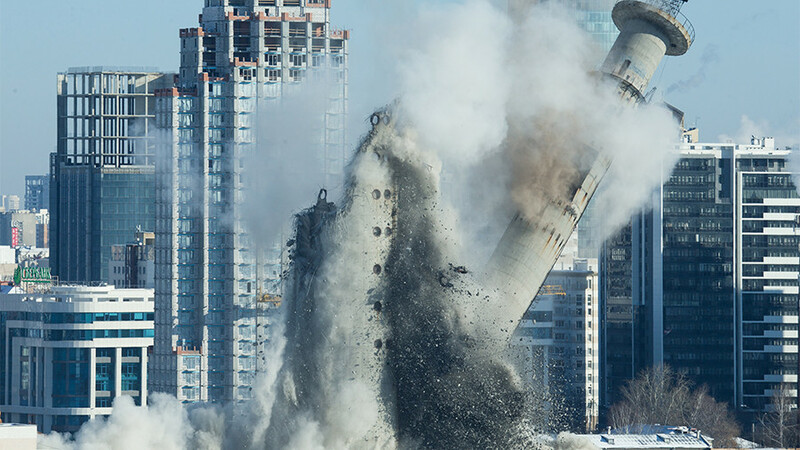 World Cup 2018 host city Ekaterinburg has controversially demolished a Soviet TV tower dubbed a “symbol of the city’s identity” as it continues preparations for the tournament this summer. The Urals city will be one of 11 host cities for Russia 2018, which will be held from June 14 to July 15, and is currently undergoing a sprucing-up period before welcoming football fans from around the globe. The tower in Ekaterinburg began construction in 1983 but was never completed due to the collapse of the Soviet Union, meaning it stood rusty and unfinished in the heart of the city. The tower was destroyed by a controlled explosion at the weekend, much to the chagrin of hundreds of local protesters, who last week took part in a "Hug the Tower" rally. Ivan Volkov, a 39-year-old lawyer and head of a committee opposing the tower's destruction, said the 220-meter-high (720ft) concrete structure had been a symbol of the city's identity. "Now it's the symbol of the people's humiliation at the hands of the authorities because the decision was made behind the scenes. It shouldn't be done this way," Volkov told Reuters. The city’s Central Stadium – which will be one of 12 host venues at Russia 2018 – made headlines when two stands at either end of the pitch were expanded beyond the stadium in an attempt to raise the stadium capacity and thus comply with FIFA regulations.